Irata – Here I Come! This is the story of a dream come true. It is a story of great hardship and adventure, of good and bad luck, of constant vigilance, adaptiveness and ingenuity. It is just an ordinary story of the colonisation of the planet Irata. My name is Goethe. I am a green Packer, and proudly so. I was born and raised in the once beautiful port city of Tobor s’Lacsar, which nowadays is known as Silconia Prime’s dullest, shabbiest and most dangerous city, and I still live here today. As an experienced MULE engineer specialising in Smithore MULEs, I make a decent living, earning enough to feed myself and my family. My family, that is Stella and the twelve kids, all of them cute little Packers with surely great destinies, if only I could provide them with a better environment! However, upholding this decent standard of living has become increasingly difficult during the last few years. Our local Comb Council has proven to be more and more incapable of dealing with Silconia Prime’s four gravest problems. First, there is the overpopulation, resulting in overcrowded cities like Tobor s’Lacsar. To counter that, the Comb Council has put a ten-kid policy in force a few years ago, with no tangible results (probably because most people just ignore it, and even the Council doesn’t kill kids). Second, there is that terrible Smithore dust pollution due to MULE overproduction. Smithore is the main raw material for the “Multiple Use Labour Elements”, that is why everyone – especially those wisecrack Mechtrons – is mining for it. Third, there is the people’s greed for Crystite, the rarest and most valuable substance in the universe, which leads Silconians to unholy exploitation (of everything), beyond belief. To top it all, since a few months our planet is being overrun by strange yellow dotlings of unknown origin. In theory, these dotlings are easy to get rid of, because they are edible (and actually taste quite good). Being not only a Silconian problem, the issue has been taken over by the supreme government. But as yet, even the intergalactic Core Council has failed miserably in coming up with a viable consumption strategy. I’m not holding up my hopes for decisive Council action any longer. Decisive personal action is required, and I’m ready for it! Very convenient for decisive people like me, the intergalactic Core Council (located on far-away planet Earth, home to Humans and Mechtrons) has never stopped spending vast amounts of research and development money for space exploration, resulting in frequent discovery of new, habitable, colonisable planets. Since I was a little kid I was dreaming of one day leaving Silconia Prime and finding a better place to live. For some reason I dreamt of a magical place with unpolluted lush red meadows, clear black skies with a full white moon, friendly MULEs made of cutting-edge technology… A place with lots of space to live, untainted by any kind of dotlings (which were a plague even in my childhood). Yet again very convenient, today the Core Council has published a new leaflet, seeking pioneers for the colonisation of the newly discovered planet named Irata. Strangely enough, the Council names every newly discovered planet “Irata”. But I have long since given up on trying to understand the Council’s reasoning. Today’s leaflet looks gorgeous – this new Irata looks just like in my childhood dreams, lush meadows and everything! It looks like it is – no, it will be the perfect place to bring my family out of Silconia Prime’s misery and into bliss! I’m fed up with just equipping the MULEs of other pioneers to realise their dreams! At last I want to realise my own dream! I will be the bold pioneer now. Ignoring family. Fleeing to the Comb Council office. But aren’t three hundred and sixty-five days of loneliness and the bulk of my savings a small price to pay for potential bliss, for leaving Silconia Prime’s misery behind? Rhetorical question! While paying the ticket, I was able to get a brief glimpse on my Colbus’s passenger manifest list. Being a very tiny vessel, the Second Colbus is restricted to just four adventurous pioneers. I wonder why the Council makes the Second Colbus so tiny in the first place..? But no, I had already decided to stop wondering about the Council, they sure have their reasons. After all, there’s another thing for which they have to be highly appreciated. They never print leaflets for a new Irata unless they have already sent a gigantic First Colbus to the new planet, which contains a town. The town again consists of a spaceport, a bunch of MULEs from overproductions, MULE engineers, Comb Council bureaucrats, and some other helpful stuff. Imagine colonisation without that! Long live the Council! Stupid humans. First, they allow their trusty old MULEs to mutate, gain consciousness and evolve into a new super-intelligent species which names itself “Mechtron”. Then, they allow this species to gain influence in the intergalactic Core Council. To top it all, they allow a bill to be passed which states that every seat not sold on a Colbus is automatically assigned to a Mechtron. Can you believe that? After a long journey on a very ragged Colbus, I have landed on the planet Irata. I arrived safely in the small but already bustling town of Net’nub, capital city of Irata and home to the local Comb Council (all thanks to the First Colbus of course). The next transport ship – with my family aboard! – will only arrive in twelve months. The arrival was a wee bit of a terrible shock for me. I should’ve known it, I should’ve expected it! Once again, the Core Council has shown its ingenuity in deceiving righteous people like me with their marketing – no, propaganda! – campaign. It’s not my fault that I’m shocked. Not my fault! In the Council leaflet, this Irata had a remarkable resemblance to the Silconia Prime of a few years ago, before it became polluted and crowded, before the yellow dotling plague. In reality, this Irata has a remarkable resemblance to the most boring place in the galaxy. Dull grey skies, dull grey land, harsh grey mountains. Most of Net’nub, though a young town, already blackened by Smithore dust. Only a few coloured spots to be seen, obviously belonging to MULE engineers keeping their shops clean and orderly (that’s what they do – I did – best). But I must stop sulking. I’m doomed to succeed now. As expected, I wasn’t greeted very friendly by the Net’nub townspeople, especially not by the local Comb Council. Sadly, Packers have never been much valued in the galactic circle of species. “Cute little Packers like you should rather stay home and eat dotlings instead of pioneering planets” – that is something I heard being said more than once. Actually, I heard it being said by every single person I met in the first few days on Irata. Including my “fellow” pioneers Nostaw, Revolg and Numbnuts (that insolent jam jar even said it with special emphasis on “little”). And including my ex-fellow MULE engineers (consequently I quit my union membership). Of course I didn’t say that to anyone. Nevertheless, the Comb Council bureaucrat recording my first claim must have found something about me very amusing, because he was consumed by a very alarming giggling fit during my entire visit to the office. As it later turned out, I had every reason to be alarmed. Not surprisingly, my fellow pioneer Mechtrons and that purple Spheroid also picked riverside plots initially. Goodbye, oh dream of Food Supremacy, which would have been most natural for a Packer like me… I have to think of something else, and quickly. Nevertheless, that sweet riverside plot is a good spot for producing food, so why shouldn’t I. Might come in handy later on, though I don’t really feel hungry right now. So, I went to the town’s MULE store and bought one of those cutting-edge technology MULEs the leaflet was boasting with. At closer inspection, it turned out that Irata’s MULEs were consisting more of highly outdated “technology” such as dial telephones, can-openers and table lamps… Yet again the Council fooled me, but it’s not my fault, is it! I paid a reasonable price of $25 for equipping my still aimless MULE with a decent food processing device, and patiently led it to my riverside plot of land. The poor little thing still looked a little confused about what it should do now, but I’m confident that over time, and probably helped by a few fellow Food MULEs in the vicinity, it will learn how to produce food more and more efficiently. For some reason, Irata’s Comb Council decided not to sell additional plots to us pioneers at the beginning of the first month, which left me (and everyone else) with a considerable amount of cash to spare. That is when I had the idea for an ingenious plan. At the beginning of the second month, the Council sold plenty of land plots, and everyone except me took the chance and bought additional land. I didn’t let the meteor-struck plot lead myself into an early Crystite frenzy, although meteors are usually full of that precious substance. Instead I equipped my fancy new MULE destined for that plot with a top-notch Smithore mining device. With the money I saved by not purchasing a plot and not equipping a Crystite MULE, I simply bought the whole stock of Smithore from the only store in town, knowing that the First Colbus’s shipment of MULEs would run out sooner or later. Faithful to my plan, I used the next few weeks of colonisation for claiming remote mountain plots and equipping them with Smithore MULEs. I even found some spare time for hunting the odd Wampus up there. Watching my rivals contentedly at first, on one evening I suddenly realised that I had made a grave, grave mistake. While focusing solely on Smithore mining, I neglected to ensure a healthy flow of energy for my energy-hungry MULEs. Personally, I was never hungry in the first months, due to the outstanding production of my first-claimed plot used for food production. Probably this was the reason I neglected the needs of my MULEs? Need to feel the pain myself before I can empathise with others? I’ll be more vigilant next time. Lesson learned. But unfortunately for me, that did not prevent my fellow pioneers from taking advantage of my precarious situation. I’m not talking about the Mechtrons. They were as careless as me with their energy production, or maybe their electronic brains simply consumed too much energy for themselves. I’m talking about that sneaky Spheroid pioneer named Numbnuts. He scented his chance in the energetic vulnerability of the Mechtrons and me, because he still had plenty of surplus energy at his disposal. After the markets opened, I virtually begged him for selling his energy for the greater good of the colony (and for my smaller good). In a sudden rush of mercy (or planned deception?) he began selling me energy in the last second before the markets closed – I got one unit! – only to see him dropping out of the transaction again, leaving me with too little energy for successfully supplying my MULEs in the next few weeks! In addition to all of that energy misery, the primal fear of all Crystite-loving Irata pioneers also came true in this month. Space Pirates landed, the most vicious breed. They took with them the whole Crystite production from all those greedy pioneers who couldn’t start early enough with it. Oh my. That month didn’t start very well. Maybe I should’ve gotten up earlier? Anyway, when I woke up on the first day of the month, I had a Comb Council notice in my mailbox, informing me of a “bureaucratic slip-up” which happened when I filed the claim of my first plot. They just took it from me again! That beautiful orange-coloured riverside plot! Deallocated! Free for public claiming again! You wretched bureaucrat! I suspect it was you, yes you, the one with the giggling fit! Don’t try to deny it! I will vote you out of power! As soon as I return home to Silconia Prime! But that tragic personal stroke of fate, and the ongoing energy shortage, weren’t the only issues troubling our young colony. Yes, I say “our” colony, because even after all that happened, I still believe in the greater context of things. Yes, maybe the totally unfair loss of a correctly claimed plot of land serves some kind of higher cause! Maybe there even is a glimmer of hope for a mouldering purple jam jar like that Numbnuts, who undoubtedly had something to do with the “bureaucratic slip-up” which led to the deallocation of my plot! Bribery! These weren’t the only issues of the colony. My fellow pioneers were consumed by the greed for Crystite profit very early on. Due to that, still none of them seemed to scent my ingenious Smithore plan. Talking about greed, well, I guess I have to cautiously admit that at that point in time I may have been consumed a teensy weensy bit by a certain greed for a positive outcome of my ingenious Smithore plan. With everyone being consumed by a greed for something, no-one realised that an expanding colony (and we expanded fast!) required an equally expanding amount of food to keep us pioneers well fed and thus able to travel the long distances between our remote plots. Being not one of the more dim-witted Packers, I ingeniously (yet again!) and quickly reequipped one of my countryside plots with a food processing MULE. But that was just a drop on the ocean. The rest of the colony (Numbnuts leading the pack, certainly!) neglected to expand food production to a reasonable scale. A few weeks before, my beloved riverside food plot had already fallen victim to a Council bureaucrat. My newly equipped countryside Food MULE – being very new to this business – will produce only a small amount of food which can only keep myself alive. I can’t help the rest of the colony. Could anything worse happen to the colony, or to me? You guessed it. Rhetorical question. Yes it can. Without any advance notice, a pest decided to attack and devour the minimal food production on my newly developed countryside food plot. My new Food MULE could do nothing but stand by and watch it happen. That must have been quite a shock for it! With no-one else in the colony producing significant amounts of food (partly due to the energy shortages of course), and the only food store in town sold out already weeks ago, I am doomed. The colony is doomed. I think I am going to starve to death, or commit suicide, or maybe just commit suicide by starving to death (for convenience’s sake). I am barely alive. I just made it here with my last reserves, to the Council’s land claim phase, eating the last crumbs of food left in my pockets. Being as crushed as possible (I’m already last place in the monthly pioneer rankings published by the Council), a miracle happens. I manage to get back my riverside plot! In your face, giggling bureaucrat! After going through the claim documents over and over again, I’m pretty sure that this time, my plot claim is recorded correctly with Irata’s Comb Council. Reassuringly, this time the bureaucrat only had a minor and far less alarming giggling fit. Finally, things seem to be getting better! Strolling around my mountainside plots, I accidentally stumble upon a Wampus who in return eagerly empties his well-stuffed purse on me. With that additional yet unexpected money, I am able to reequip my plots with MULEs for food and energy, and at the same time increase my Smithore production! The markets won’t agree with me. Smithore prices remain around $60, which is just a little bit higher than average. One of the Mechtrons, who decided to switch over to Smithore a few weeks ago, is already selling, but fortunately I saved enough cash to jump in for the store and thus prevent the construction of new MULEs. The pirates strike again, again landing a severe blow to the three other pioneers who are betting their fate on all-out Crystite production already. From a merchant in one of Tobor s’Lacsar’s more sleazy taverns, I heard rumours that Pirates in general strike newly founded colonies only twice – never more often! – and then move on. I wonder if I can trust this merchant? Feeling like being on a lucky streak, I decide to do just that. My lucky streak still holds. Yes! I got the final First Colbus MULE! I quickly equip it with a Smithore processor, leading it to my newly claimed mountain plot. I can’t help but feeling at least a little sorry for the purple jam jar, who didn’t get a MULE anymore this month. Well, my lucky streak could snap, which happened just then. Just before the markets opened, the MULE on my newly developed mountain plot decided to go crazy and ran away with all of the production, which was a significant amount (eight valuable units of smithore!). If my ploy worked out right, that stupid crazy MULE might have cost me about $1,000 by running away! And my ingenious ploy did work out right. After the markets opened, I was delighted to see that the Smithore prices had risen up to a whopping $140! That’s not very surprising of course, considering that still about half of Irata’s plots were unallocated and waiting to be exploited. I sold all my Smithore, making my first fortune. But altogether, I think I can be quite satisfied with this concluded month. My fellow pioneers will probably disagree of course. After my highly successful, ingenious Smithore ploy, and with the words of my home town’s merchant in mind, I decide to start reequipping all of my Smithore MULEs with Crystite processors. Reequipping works very smoothly, as I have enough food, energy and cash in stock to make it happen even with the high MULE price of $280. Another stroke of fate hits the colony, when the town vanishes in a great ball of fire, stirring up the whole community into frantic activity once again. For some reason though, the fire failed to burn the giggling bureaucrat, because on one sunny morning I got a notice to pay a ridiculous amount of taxes for my old computer. I ignored it. Anyway, I suppose the fire will drive up food and energy prices quite significantly for the next few months. That’s good for all of us who have scaled up their respective production, like Numbnuts and me. That’s bad for the Mechtrons, who are, despite being super-intelligent, simply too dim-witted to grasp a simple fact like that. Instead, they happily continue reequipping all of their plots for Smithore production, not realising that prices are going to drop sharply soon. Maybe the Great God of Smithore told them to? We’ll never know. And frankly I’ll never care, silently hoping that one day there won’t be any need for dim-witted super-intelligent Mechtrons in the universe anymore. Nothing happens. Really, nothing at all! I use all the spare time to build a nice, spacious riverside mansion on my first-claimed plot, in anticipation of my family (just three months left!). At the end of the tenth month, I am sitting back in my cosy armchair on the mansion’s terrace, elatedly watching my rivals trying to catch up to me again (in vain of course). The turbulent times of the early days of the colony are finally over, or at least I hope so. All my plots are equipped with just the right MULEs, all of them functioning within normal parameters, and all of them getting more efficient with every passing week. Everything runs smoothly, there is enough food for me, there is enough energy for my trusty MULEs. That’s how it’s supposed to be, my dream come true, bliss for my family. If only they were here already! I can finally enjoy life with nothing more to do than going out for catching the Wampus every once in a while. Kind of like having a nice house at the Côte d’Éosine back on Silconia Prime in the good days, doing nothing but sand-sailing, or jogging along the famous Promenade des Mulais. But alas, I was feeling too secure and too content too soon. The Council has neglected to share a tiny, but very relevant bit of information about Irata: This planet is geologically still very active. Hence, a giant planet quake woke me out of my Wampus-catching laissez-faire bliss one morning, and I spent the next few weeks with busy repair work in the highest mountain plots, where my poor Crystite MULEs had simply tumbled off the tops and exploded. I am watching the evening sky. The next transport ship from Silconia Prime is arriving! Finally I am reunited with Stella and the kids! But it doesn’t matter, now that I’m reunited with my family, even my measly amassed fortune of $27,064 fills me with indescribable satisfaction! My spacious mansion, down by the beautiful orange riverside on my very first claimed (and reclaimed!) plot, will be our new home for the coming years, and will make up for the lack of money more than enough. So, all in all, my first year on Irata ended quite well. 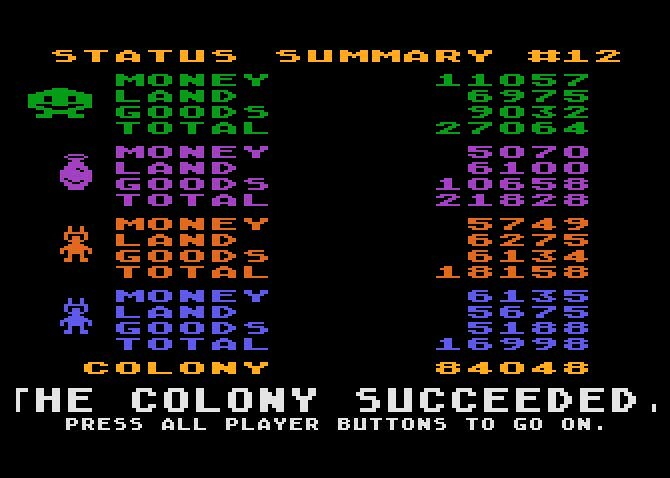 Even despite the low Crystite price at the end of the hot colonisation phase, the intergalactic Core Council recognised our colony as a “successful” one. Wise choice from their side, for what possibly could we have done about the Crystite prices? They’re intergalactic, universal, beyond my reach! Of course that doesn’t mean that another colony can’t be better… One can always be better… But, I need to stop sulking again. I’m perfectly content with what I have, with what I achieved here on Irata. Okay. Reluctantly I admit that I am content with what we all achieved, we, the group of four adventurous pioneers. Well, that is my story so far on Irata. But what will the future bring? After all the thrill of the past months, I finally got around to sit back on my mansion’s terrace and get a good look around the planet. Irata has changed significantly since I first set foot on it. The colonisation efforts from the past months have left quite an impact on it. Net’nub has become even blacker from Smithore dust pollution, and unused MULEs are beginning to swell from the store. Damn those “super-intelligent” Mechtron Smithore miners who just don’t know when to quit! Most of Irata’s land has been allocated for industrial exploitation instead of residential areas. People are already crowding in the city more and more. Has no-one of the Council members ever played Sim City? Only thanks to my First Founder Award, and thus good connections to the Comb Council, I was able to convert my riverside food plot into a dual-use plot, which allowed me building my mansion far from the crowded town. But for how long will that last? How long until the next “bureaucratic slip-up” happens? I don’t want to sound too pessimistic, but I have also already heard first voices for a “fifty-kid policy” among the Comb Council members – it can’t take too long until a respective bill passes. And to top it all, I swear I just saw the tiniest yellow dotling swimming across the river. Silconia Prime all over again? No way! Decisive personal action is required! But not before dinner with the family. Visiting Net’nub again on the next day, shopping for groceries, I came across a new leaflet the Core Council has published today. Long live the Council for their continued exploration efforts! Alas, a new Irata has been discovered, and according to the leaflet it looks just like in my childhood dreams! Lush red meadows, clear black skies with a full white moon, friendly MULEs made of cutting-edge technology… The Council wouldn’t dare twisting the truth again, they just wouldn’t. And if they do, I’m surely going to vote them to hell! Well, as soon as I return to my home world of Silconia Prime. Damn those colony voting laws. But after all, it’s only a small price to pay for perpetual bliss, isn’t it? My family can cope with another year without me, can’t they? Rhetorical questions! Irata, here I come! I wonder who will take the three seats next to me this time. I’m fed up with those Smithore-hungry Mechtrons destroying all chances for a truly balanced, truly successful colony. That vicious circle of destructive colonisation has to be broken. There has to be another way. It turned out that those last words of Goethe were the beginning of the Galactic Revolution, which led to the permanent ban of Mechtrons in all of the Core Council’s colonisation efforts. Posted in M.U.L.E. Art, M.U.L.E. Art - Literature, World of M.U.L.E. In its August 17th press release, Ozark Softscape let a big, almost Wampus-sized cat out of the bag. A board game adaptation of the classic game will hit the stores this November 2015. The board game is created by Heikki Harju and published by Finnish board game company lautapelit.fi. In this interview with World of M.U.L.E. (hereafter named “W.o.M.”), creator Heikki Harju (“H.H.”) tells the story of how the game came to be. W.o.M. : The announcement of the M.U.L.E. 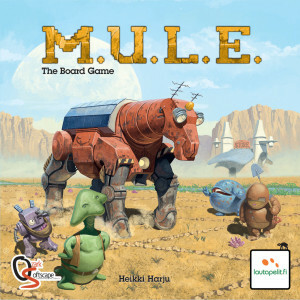 board game was met with enthusiasm by the World of M.U.L.E. community. Thanks for sharing some of the game’s background story with us. First, please tell our readers a little bit about yourself. H.H. : I am a lifelong M.U.L.E. fan from Helsinki, Finland. My day job is doing strategy and business development for high technology. Coming to think of it, M.U.L.E. is also about strategy and business development. I like playing games with strategy and business mechanics. When that’s not enough, I design my own board games. I also enjoy role-playing games a lot, and in my opinion M.U.L.E. also has a strong element of storytelling and identities that are built over a game. Immersion into the story and interaction with the other characters is part of its magic! W.o.M. 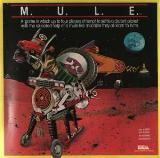 : What is your fondest memory of playing the original M.U.L.E. computer game? What’s your favourite species and colour to play with? H.H. : I have so many fond memories associated with the game. The strongest memories are actually not about the game itself, but about the friendships built and strengthened when playing it. You know you can be Best Friends Forever with someone who can forgive you for letting them starve in a game of M.U.L.E. Then there are those feelings of competence you get when you manage to milk some cash by outsmarting The Store. I also remember when one of us accidentally caught the Wampus the first time. We were like: “what the heck is that?” At the time, I actually saw the picture of the cave as being part of the Wampus. It looked like some kind of a huge, kind blob. I usually played the Packer. I liked his positive attitude and the swing in his step. I usually chose the green colour because it was very clear on the screen against any background, and my friends graciously let me have it. Probably so that they could better keep their eyes on that opportunistic piece of smiling lettuce, i.e. me. W.o.M. : How did you come up with the idea to create a board game based on a more than 30 years old computer game? When did you start the creative process, how long did it take? H.H. : My first files date back from 2001, so it’s been almost 15 years in the making. When we started this project, we did it to play M.U.L.E. as a board game ourselves. To us (and many others), M.U.L.E. already felt like a great board game, but one that required an obsolete computer to play. M.U.L.E. wanted to become a real board game. In my opinion, M.U.L.E. should be played with your victims, (aka friends and fellow colonists), in the same room. I’m glad that other people have released have online versions for those who prefer to play that way or can no longer play face to face, but I actually think that board game with everyone assembled together is in many ways the best platform for this game. 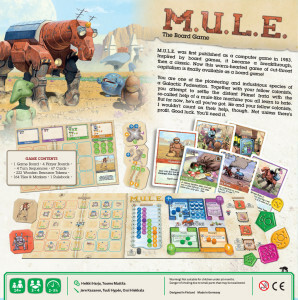 The only drawback is not being able to play the M.U.L.E. theme. But like one fan pointed out, I can easily do it myself! That said, I’d actually love to hear someone record an A Cappella version of the theme with three voices. Wo.M. : What was the “work-split” with your co-creator Tuomo? Any anecdotes / early design drafts to share from the process? H.H. : We started the project together, threw our ideas together and crafted the first prototypes together. We started by scavenging camels from Durch die Wüste and Tuomo crafted our first resource counters from ironing plastic jewelry beads. Over time, the project became increasingly my project, especially when it came to turning ideas into concrete prototypes. The fact that we live in different towns was part of it. That said, this game would never have happened without Tuomo. In the next few weeks, I’ll be publishing entries of a Designer’s Diary in boardgamegeek.com. Check out the game’s home page there for more information and updates. Give the game thumbs up and participate the conversation if you like what you see! W.o.M. 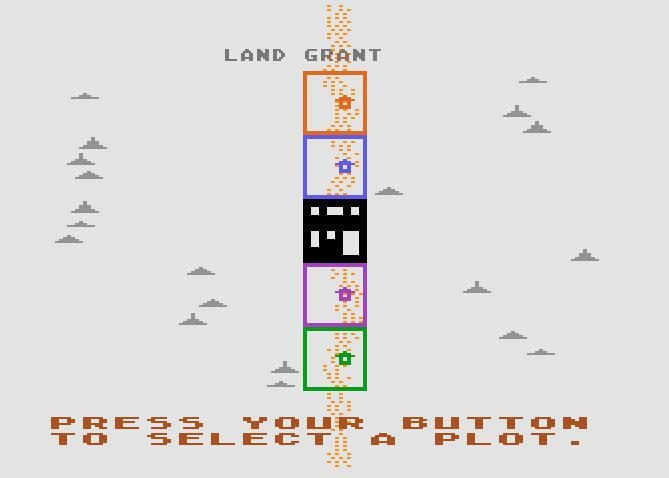 : The original computer game uses quite some “computational power” (for 1980’ies standards at least…) to support the human or human/computer gameplay – be it calculations of supply/demand, stock management in the town, economies of scale and the learning curve for production of goods. How did you tackle these aspects for the board game? H.H. : We humans actually have very powerful computers in our heads. However, they are different from computers. Take numbers, for example. Using prices and quantities that vary between 0 and 255 is a very friendly design for an 8-bit computer. That’s not true for humans. We do best with numbers between 1 and 10. It’s not easy for most of us to count in our heads how much is 178 x 43, but counting 8 x 2 is quite easy. The same game mechanics can be built with these human-friendly numbers, it won’t change the big picture. In other ways, human brains are also superior to computers. For example, experienced players can tell from a glance who is currently winning the game. I guess we are conditioned to recognize who is stronger and who is weaker than us by nature. Teaching a computer to do this is very complicated and in any case usually results in a rigid model that flexible human minds can easily learn to beat. We like building our understanding of situations gradually and instill meaning into random events, creating a story in our heads as we go. For many reasons, I have not taken a “reverse engineering” design approach. Rather, I have tried to consider the original intent behind various mechanisms in M.U.L.E. (why they were put there, why they were built like that and how did computer medium affect that design choice). Then I tried to introduce a board game mechanism that achieves the same intent with human interaction and board game mechanics. Then I prototyped this, tried playing with it, get feedback. 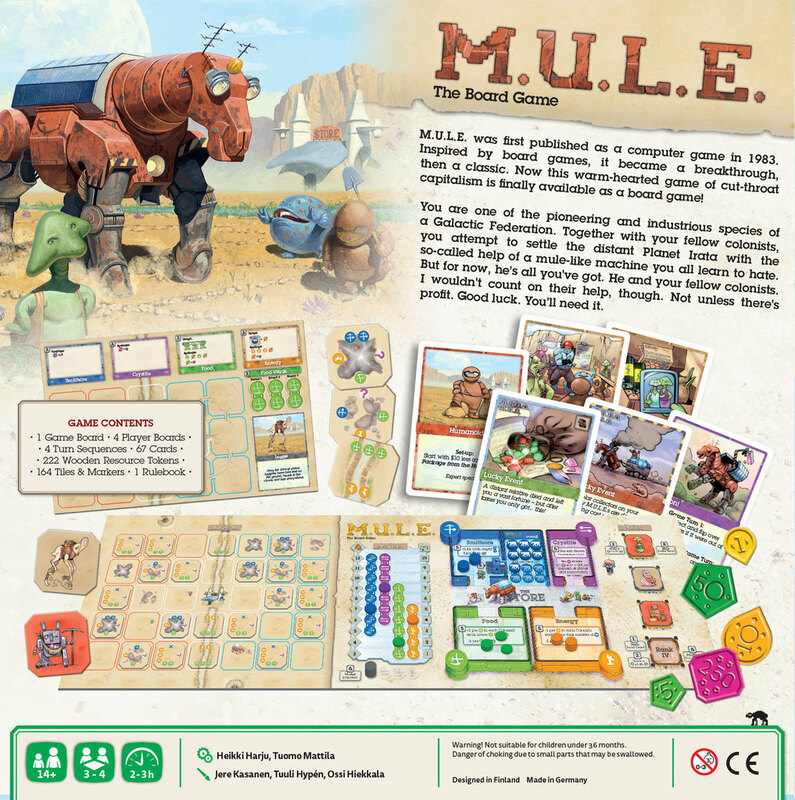 I’ve gone through dozens of design iterations until both the players and I liked it and it began “feeling” like M.U.L.E., or even better. Certainly more transparent and adaptable. After all, we are not bound by the limitations of a computer. W.o.M. : The question of Wampus hunting has already been answered (yes, we can!). How about playing with less than four human players – how did you tackle the challenge of adding “artificial intelligence” (those clever Mechtrons!) into a board game? H.H. : There are no “AI players” in M.U.L.E. The Board Game. The focus has been on getting the 3 to 4 player experience work with high player interaction. After all, if you want to play with AI, you can play with a computer. Adding a 5th player would be fairly easy and if we get enough demand to publish an expansion, that might very well be included. The game adjusts for 3 players with a few simple changes in set-up quantities. Two-player support would require more comprehensive changes or possibly even a different game. Again, maybe later. W.o.M. : Judging from the board game cover design, you took extremely good care of capturing the original game’s design. 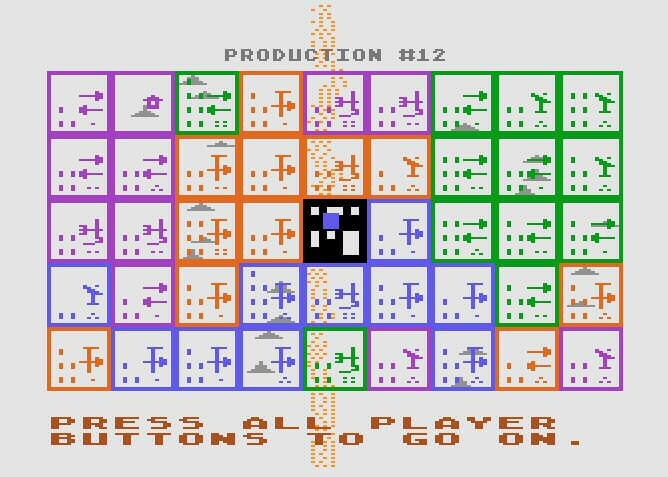 How difficult did the designers (Jere, Tuuli, Ossi) find it to extrapolate from the crude early 1980’ies 8bit graphics to a modern design? H.H. : It was always important for me that we are creating imagery for a story. The art should help people immerse with the game and put them in the mind of being rugged pioneers in a quirky planet. When we started creating the final art, at first someone proposed that we could use screenshot images from the 1983 computer game. I felt that was the easy way and while it might amuse us old-timers for a while, it would not build and enrich the story further and young people would just shake their heads. When we discussed with Jere about the art direction, we agreed that there should be a quality of frontier ruggedness in the player characters. We felt the M.U.L.E. itself to be an almost melancholy character, a character embodied for example by drones Huey, Dewey and Louie from Silent Running. 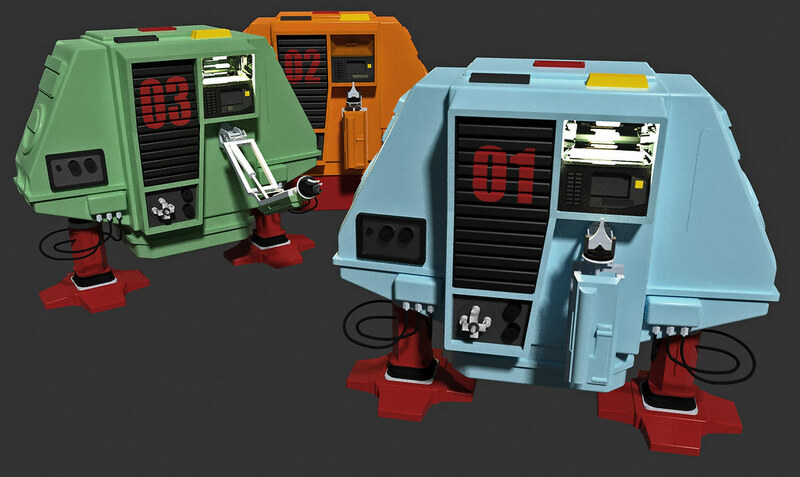 We also decided to use a colour scheme that resembles the scheme of M.U.L.E. computer game, just with a bit softer tones. Ossi, our cover artist did much of the heavy lifting to begin the process, and he had to bear with our endless requests to change this or that based on our vague verbalizations. In the end, we were very happy with the outcome, though! Then Tuuli, who is a very skilled cartoonist, took over to create the art for game components. Using Ossi’s work as a springboard, her art took us off like a runaway M.U.L.E. Creating that spark of life and soul comes naturally to Tuuli (after just years and years of practice). I promise you’ll be amazed when you see her imagery in the cards. W.o.M. : How did you manage the publishing process? H.H. : There are many reasons why the process took so long: For the first years, I was just making this for our own use. There were years when I did nothing with it and it was just sitting in my drawer. Then, when I first thought about publishing it, the ownership of M.U.L.E. trademark was unclear to the public. I even once approached you, Christian, about it, many years ago, but back then even you were uncertain. Finally, finalization and publishing takes time, and unfortunately our first publisher candidate went bankrupt during the process. For a long time, publishing seemed impossible and no-one seemed to know who actually owned the brand. I absolutely wanted to respect the creators and did not want to come up with another design. So it was for years. This changed when Ozark Softscape was re-created. I just accidentally found them one day with a search engine. Later I saw they had endorsed Planet M.U.L.E.. Suddenly, licensing the brand was a real possibility. That opened doors to publishers. Our first publisher candidate Tuonela Productions took us to their booth in Spiel 2011 (thanks guys!) where we demoed the game to anyone who happened to find us. Again, the feedback was very encouraging and constructive. Many people just wanted to buy the game right away. Unfortunately, Tuonela went under. However, now we had met and talked with several publishers on both sides of the Atlantic who were interested. Eventually I decided to go with Lautapelit.fi: The ideal partner for us, since they were both located in my home town and had proven their ability to reach a global audience with Eclipse. H.H. 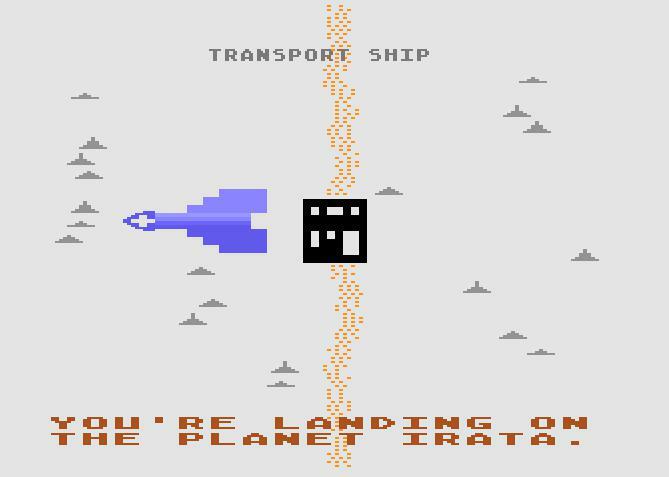 : My gaming platform was C64, back in history. It’s still the best platform for playing the M.U.L.E. theme music via its unique SID sound chip. W.o.M. : Thanks for your time, all the best and have a successful launch! H.H. : Cheers to all and stay tuned! Posted in M.U.L.E. 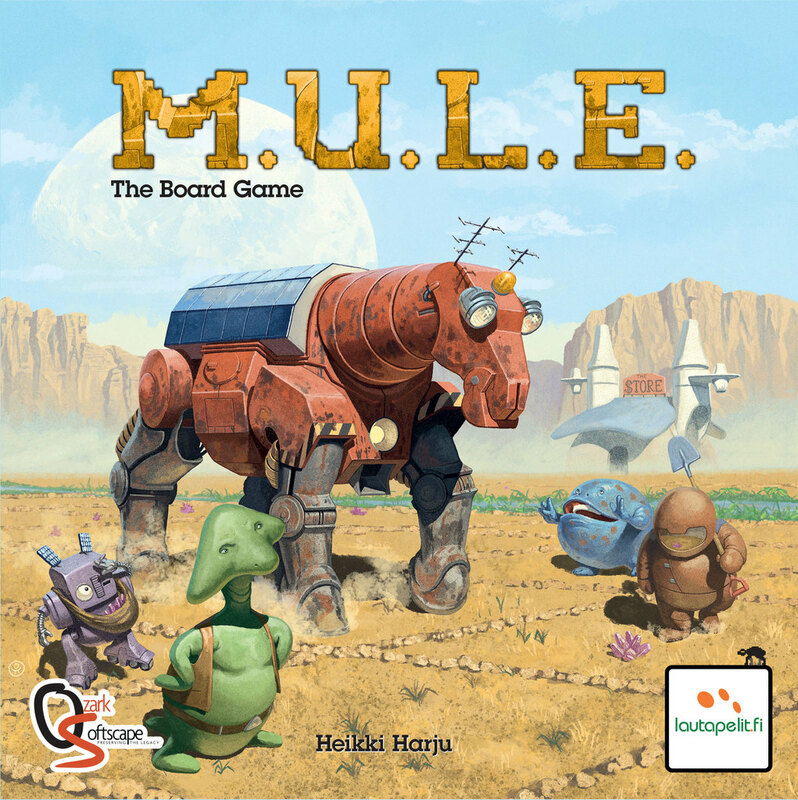 Board Games, World of M.U.L.E.